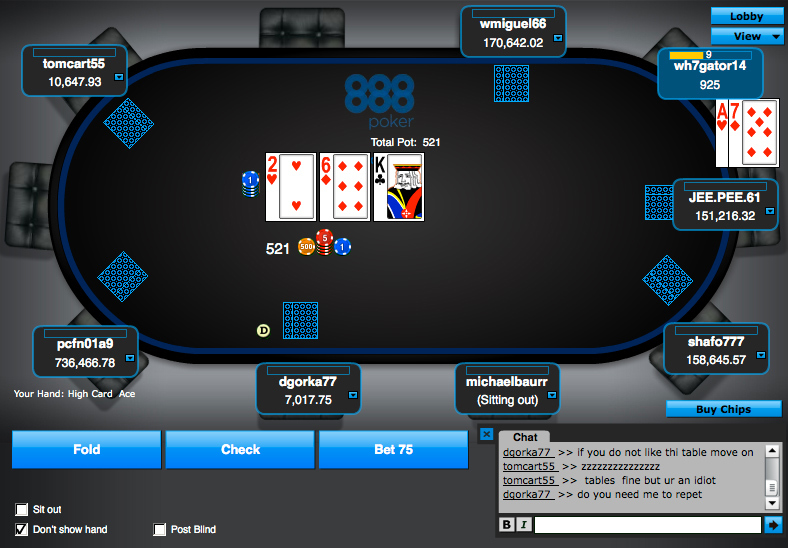 888 Poker is the main poker brand under 888 Holdings. They have established themselves as the #2 online poker room in the world, trailing only PokerStars for the top spot. 888 also became the first legalized online poker site in the state of Nevada in the highly competitive legal iGaming environment in the state. Their original poker skin was established back in 1997 and was one of the very first online gaming providers. Back then you may remember the site as Pacific Poker before it was dramatically re-branded and updated. In fact, behind PokerStars and the now-defunct Full Tilt Poker, 888 features from of the best poker software in the industry today. The room features Texas Hold’em, Seven-Card Stud, Seven-Card, Stud Hi-Lo, Omaha and Omaha Hi-Lo poker games, with tons of SnG’s and tournaments running every hour. According to PokerScout.com, 888’s real money traffic peaks at 3,500 cash players per day, easily ranking in the top 5 to 10 poker sites as far as cash game traffic goes. As I had previously mentioned, 888 already has some of the best software in the game today, especially after the massive upgrade they made years ago when they were still operating as Pacific. The site features top-notch encryption and security, as well as great deposit options for all its new players. Right now, all new players can get a $400 added deposit bonus when they sign up and fund their account at 888. The 888 Poker software provides players with attractive graphics and functions, such as 3-D avatars, integrated bingo room and casino, an always-visible cashier and an enhanced multi-table poker abilities – enabling up to 16 tables can be played on at one time. Players can also have their hand histories, which can be saved onto their hard drive and imported to hand analysis software like Hold’em Manager or PokerTracker. Furthermore, in order to appeal to a larger audience, 888poker offers a no-download client for Mac and Linux users, which has less of the layout features but it definitely is quick. The site offers a 100% first deposit bonus of up to $400. However, right now, depositing at 888 has some big-time perks that not many poker sites offer right now. They’re essentially doubling your deposit up to $400 – and that’s already including the free $88 in free bonus cash 888 is already throwing in! So basically, for any deposits up to $400, you’ll get an additional 100% back to play with right away. For example, if you deposit $10, you’ll get $20 to play. Load up $100, play with $200! You get 100% back on your initial deposit to play with right away, up to $400. 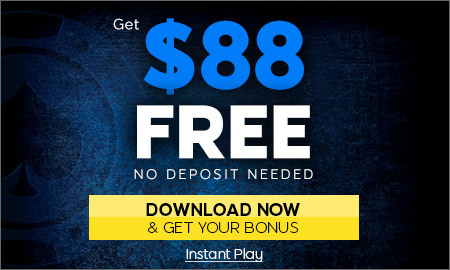 888 Poker has the most reliable amount of deposit and withdrawal options in the gaming industry today. Since they handle so many gambling verticals (888 also has a separate casino, sportsbook and bingo hall) it’s essential to their business that they’re able to process deposits and withdrawals from players all around Europe and the globe! Deposit Options: VISA, MasterCard, EuroCard, Diners Club, Solo, laser Debit Cards, Maestro, Bank transfer, Boleto, Deposito Refrenciado, European checks, E-checks, PayPoint Invoice, Wire transfers, Commerzbank OnlineBanking Web, Deutsche bank 24 Direct Debit, Dresdner bank InternetBanking, ELBA, Direct Debit, eNETS, hansabank, Neteller, InstaDebit, ClickandBuy, ACTeCASH, Moneybookers, ukash, bank transfer, PaysafeCard, EntroPay, PayPoint, Dankort debit card (Denmark), Nordea online bank account (Sweden/Finland), Paypal (Austria, Denmark, Finland, Ireland, Italy, Portugal, Spain, Sweden and UK). Withdrawal Options: Visa, Mastercard, Debit Cards, Neteller, Moneybookers, PayPal, wire transfer (direct bank account transfer) and bank draft (cashier’s check). Withdrawals are held for three days before processing. Limits are available from a minimum of $0.05/$0.10 to a maximum of $75/$150, over the various games. The rake is set at an industry acceptable standard of 5% and is capped at $3, but there is noticeable value for lower limit players – such as a maximum rake of 6 cents and up to maximums of $1/$2 games which are capped at $1.25. Another important point to mention here is that the customer support at 888poker.com is professional, having solid knowledge and are friendly when communicating by either e-mail, live chat and phone.